MU SpaceBot is a Wooden Robot Building Kit designed by Morpx. Kids work as interns in the imaginary robotics company “MU Inc” with the mission to design, assemble, and program the freshly released SpaceBot companion robot. Once finished, they will enjoy the amazingly fulfilling experience when the SpaceBot comes to life and says hi. Kids learn most when doing stuff. Starting from some basic components, such as laser-cut wood pieces and servo motors, the SpaceBot kit lets them create an AI powered robot entirely from scratch. It is during this process that they learn the inter-disciplinary knowledge from mechanics, electronics, programming and artificial intelligence. The award winning MU SpaceBot is the first to include Computer Vision and AI in a construction kit. Greeting mode: the SpaceBot will greet and interact with any person it sees. Music Mode: play cool music by a finger on a piece of paper with vision-keyboard technology. Programming Mode: kids can program the robot using their familiar scratch-compatible interface in the MU Bot app (available in Google Play / iOS App Store). A series of free self-following lessons help your kids venture into robot programing step by step. 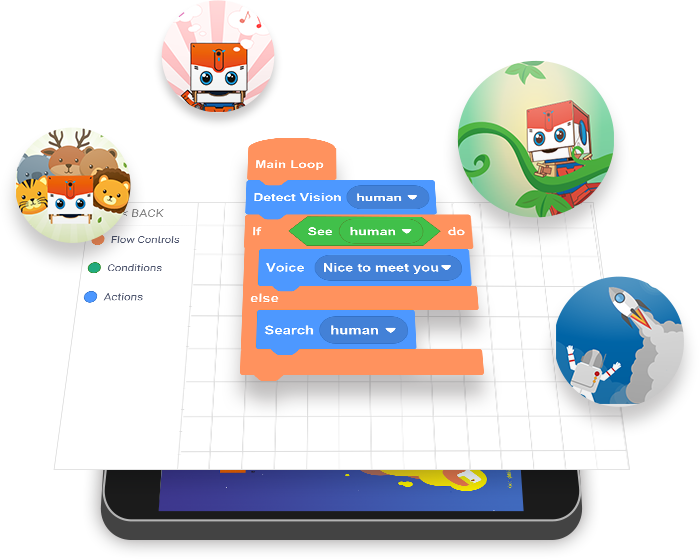 The App can also be used to record custom greeting voices for the SpaceBot.